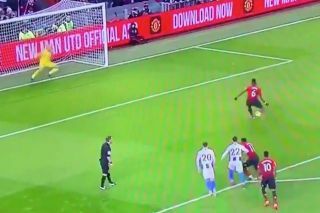 Paul Pogba opened the scoring for Man Utd in their clash with Brighton on Saturday, converting from the penalty spot to give his side the lead. United are looking for a seventh consecutive win in all competitions under Ole Gunnar Solskjaer since he was appointed as interim boss last month, and Pogba certainly set them on their way. As seen in the video below, the Frenchman stepped up and produced a confident finish to find the back of the net and break the deadlock. It extends an impressive and decisive impact that he’s made since Solskjaer arrived too, as that’s now five goals and four assists in his last six Premier League outings. The Red Devils will certainly be hoping that he can maintain this level of influence between now and the end of the season as they continue to close the gap on their rivals in the top four.